These poems were performed for the Wicked Poetry Slam in Berlin, a poetry slam showcasing political poetry. Six poets, three rounds, one theme: problems/solutions. 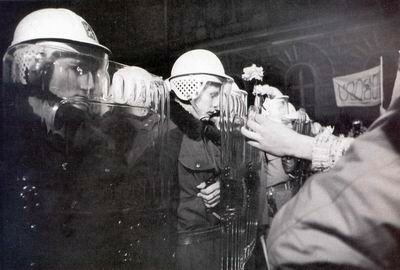 November 17th is the beginning of the Velvet Revolution— marking the brutal police crack-down on students which led to the fall of the communist regime in 1989. What are they gonna do down there? protesters in Senegal just this Monday. We released that video to say if President Trump can say that rocks are as good as a rifle, who is Amnesty International to say? What did David use to kill Goliath? So a stone is a weapon. Wait — did they just call themselves Goliath? an army of Davids can take them down. National Guard? Or rockstar, poetry, love?